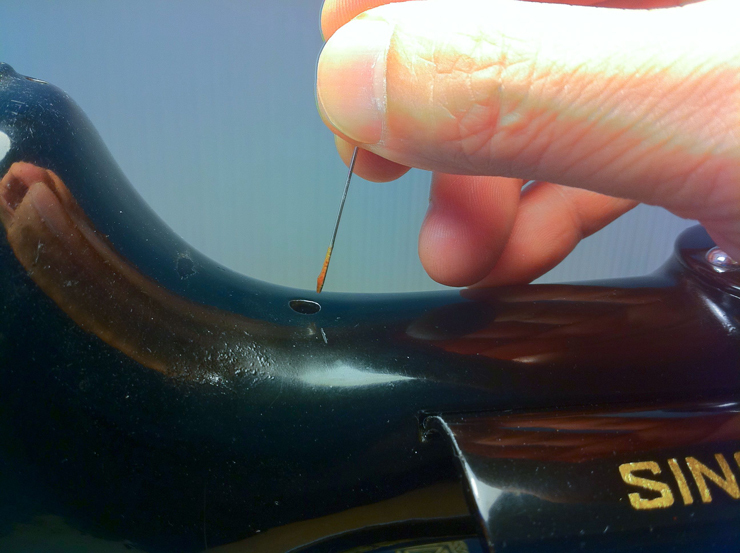 Oiling your machine can seem intimidating for the mechanically-challenged, but like most things I'll cover here, it becomes quick and easy the more you do it. And you should do it, so that your machine will last and last. (It's also important not to overdo it, which I'll cover below.) See that machine up above? 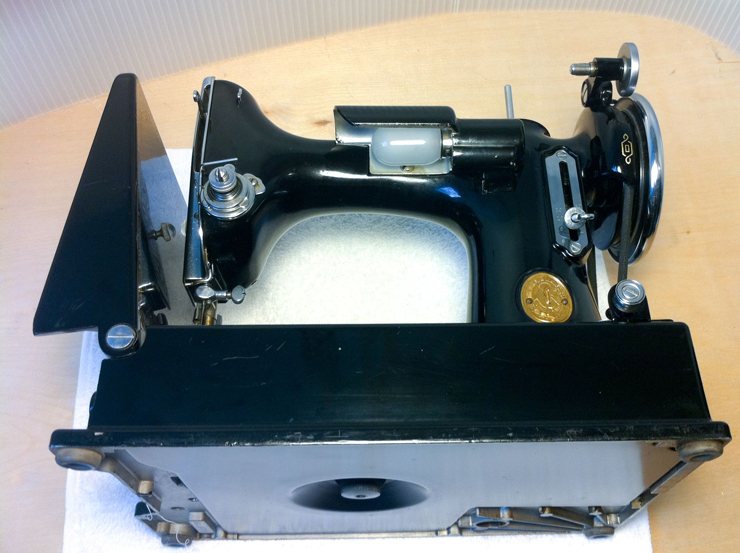 It's a 1937 model 221, the first Featherweight I ever fixed up, which I gave to a friend for her birthday. It runs like a top and I plan for it to continue doing so through regular oiling. These guidelines can be applied to any machine, but I'm using a 221 here because someone specifically requested a 221 oiling demo. In a lot of public buildings you'll see marble steps that have had a dip worn into their centers. Obviously marble is quite hard and unyielding, but when twenty million pairs of Nikes traipse up and down them, it eventually starts to wear away. The steel in your machine is no different. Two pieces of metal rubbing against each other over and over will eventually wear some material away, reducing the precision and effectiveness of that part. 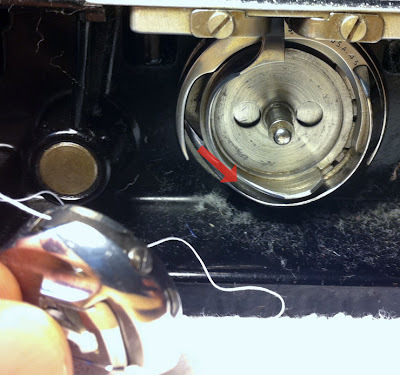 (I believe that's why I often see 15-91s and 201-2s with screwed-up bobbin winding assemblies, though that and its fix will be covered in a different entry.) But just a drop of oil between two parts provides a metal-protecting cushion that greatly extends the life of the machine. That's why we oil. The general rule is to oil the machine after every 8 hours of use. Make it a habit and you will be thanked by subsequent generations who are able to use the machine. When you hear the phrase "a well-oiled machine" that doesn't mean the thing is drenched in oil, it just means oil has been correctly applied in all the right places, so the machine runs smoothly. If you over-oil a machine, you run the risk of oil going someplace it's not supposed to go, like on wiring insulation (which is bad news). 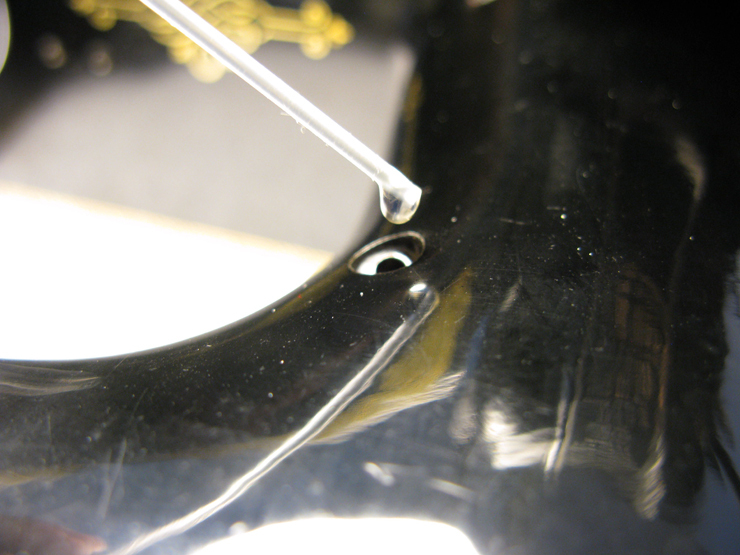 All it takes is a single drop to properly oil an area, which is why this next part's important. White Diamond. I hate this telescoping "zoom spout." At first it sounded like a good idea, but in practice it's difficult to use, especially if you're clumsy. It's difficult to get a single drop out of it, it either gives me too much or not enough. Squeezing the bottle produces inconsistent results. Even when I could get a single drop out, the drops came out too big to cleanly hit the target. 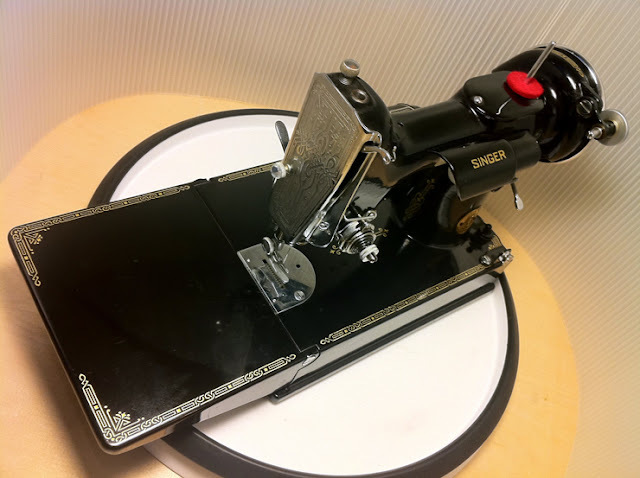 I've seen sewing machine repair guys use this thing with the precision of a surgeon, but I'm no surgeon and I'm writing this review for klutzes. Tri-Flow Oil. My favorite. The sewing machine forums are full of people extolling the virtues of this oil, which has Teflon in it to increase its slipperiness, and the straw is the best: It's easy to see the fluid traveling down it so you can predict when the drop will come out, and the drops are the smallest, which gives you better precision. At the bottom of this entry are some places where you can buy it. Singer Oil. The nozzle hole seems tiny, but the drops come out huge, so I often make a mess. I also don't like that it's not see-through, so the drops can come out unpredictably. With no straw or nozzle, it's impossible to get the oil into remote places in the bottom of the machine, the bottle just won't fit. Syringe. I'd read reviews about the benefits of using syringes to get to hard-to-reach places, but in practice I hardly ever use this thing. The Tri-Flow straw gets every place I need to go. But if I had a choice between using this and anything except the Tri-Flow, this would be it. You can't use the "drop" method with the syringe, you use the "touch" method. See description below. The "Drop" method. 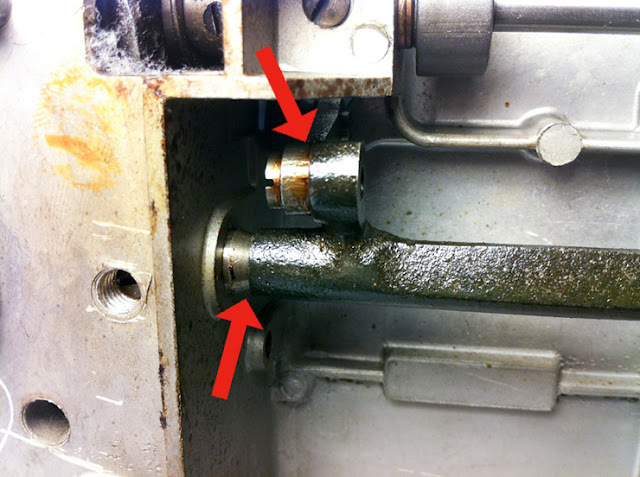 When servicing an oil hole, you just squeeze a drop out and position the straw so the oil drop falls into the hole. (There's an occasional problem with this, covered below in "Start Oiling.") If you don't know what an oil hole is, don't worry, you will soon. You get the straw near the target point and angle it downwards, or gently squeeze the bottle, until a droplet is hanging off the end of the straw. Then you just touch the droplet to the point where you want the oil, and it gets absorbed into that point. You have to see it to understand it. Oil doesn't work like gravity makes you think it would, it touches the part then seems to automatically flow around it. That's why you only need one drop of oil. You drop the oil off at the entrance, so to speak, and then it finds its way around the store. Let's say there's a bunch of flies in my kitchen, and I'm sending you in with a flyswatter to kill them. I could draw you a map of my kitchen with detailed notes that say "There's two flies on top of the fridge, one on either side of the sink, three by the fruit basket" etc. which is kind of silly. Better that you just go into the kitchen and hit anything that moves. 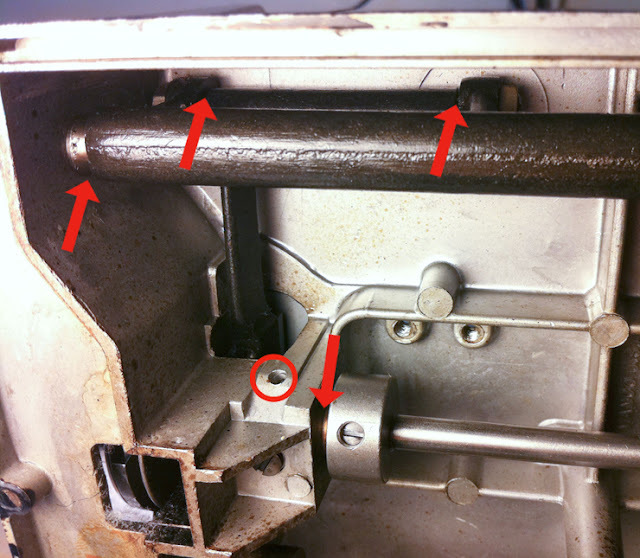 Similarly, look at the relevant parts of your machine, seen below, and turn the handwheel over to see what moves. 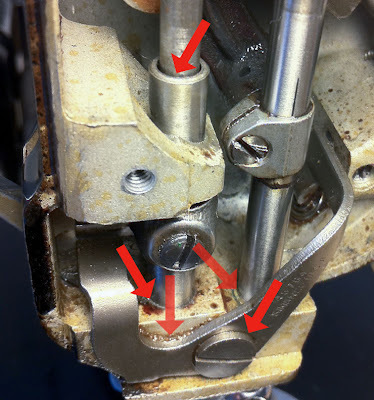 Any place where two pieces of metal are rubbing together, that's where you put a drop of oil. There are a few places you can't see that still need oil, and Singer made those locations obvious by placing convenient oil holes there. So you don't need to memorize diagrams, just use your eyes. I've taken the following photos as a reference, but frankly speaking they're more confusing than they're worth. Those photos will quickly outlive their utility when you learn to just oil every part where metal moves on metal. All you need is your machine, a towel, some oil, and good lighting. A flashlight will help for the bottom parts of the machine, but I prefer a swing-arm lamp so I can keep both hands free. 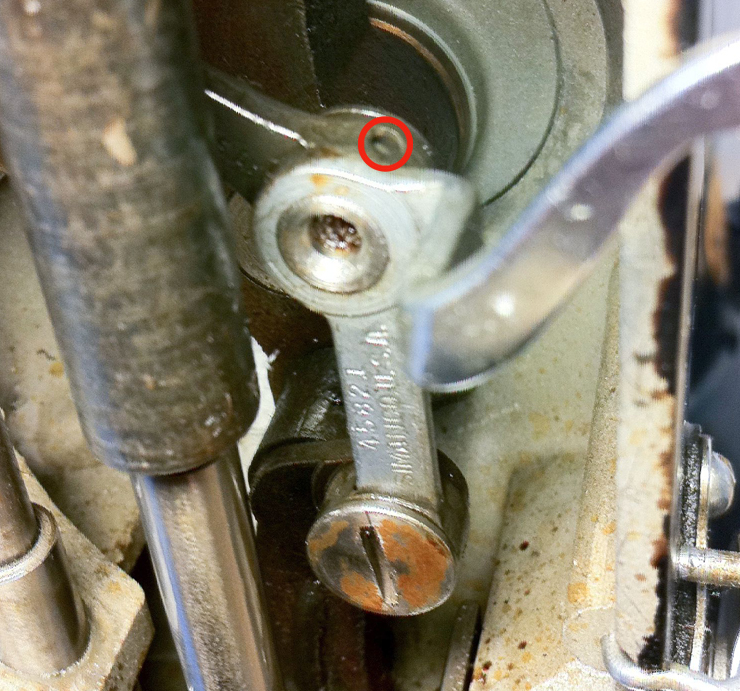 I've seen a few 221s where these two holes are clogged up with old, gunky grease. 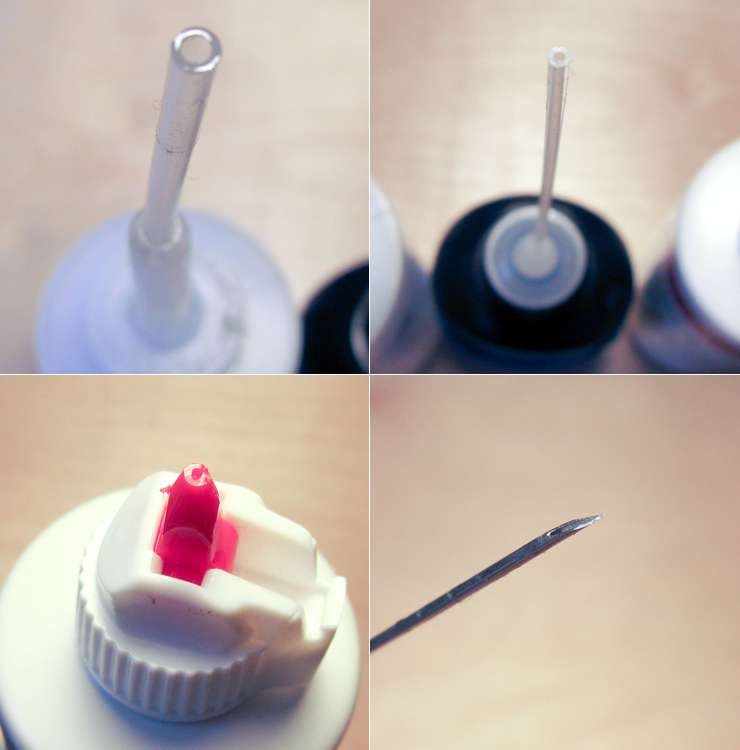 If you see that the hole is clogged, take a Q-Tip and roll it between your fingertips to make it pointy. Then stick it into the hole and swizzle it clean. You'll often bring it back out covered in nasty old grease. Now find more oil holes. If you don't know what one looks like: If there's a hole in your machine and there's not a spool pin sticking out of it, it's for oil. On the top of the 221 we see four. We also see one on the bobbin winding assembly. Inspect the holes. 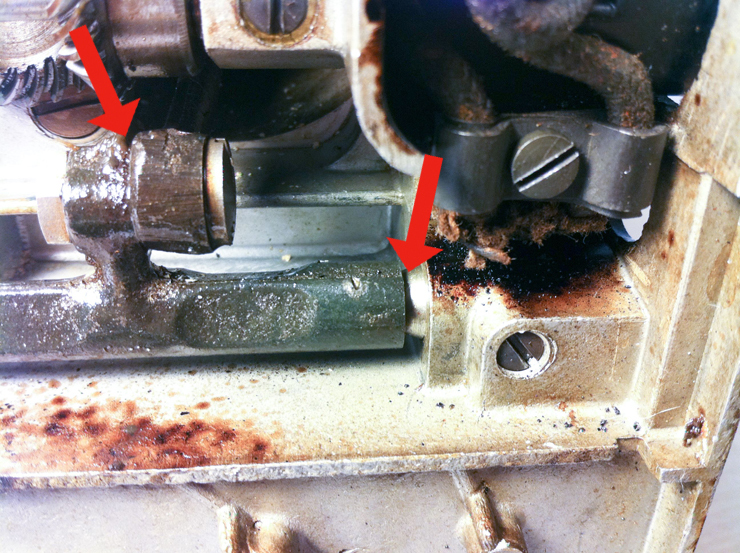 If it's an "attic fresh" machine you may find old gunky grease clogging them. 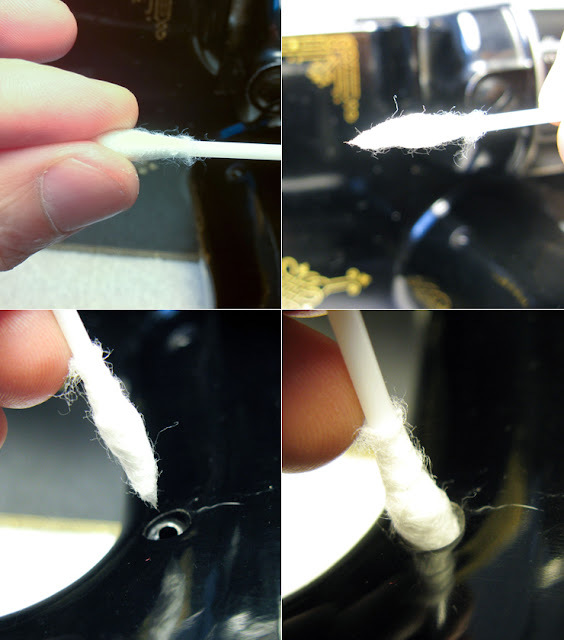 Do the Q-Tip trick or carefully clean them out with a pin, then put a drop of oil in each hole. 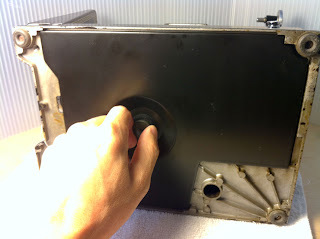 Then check out the panel with the spool pin on it. The screw that the red arrow points to? For convenience's sake, you can keep that screw loose enough so that it holds the cover on yet still allows you to pivot it open. 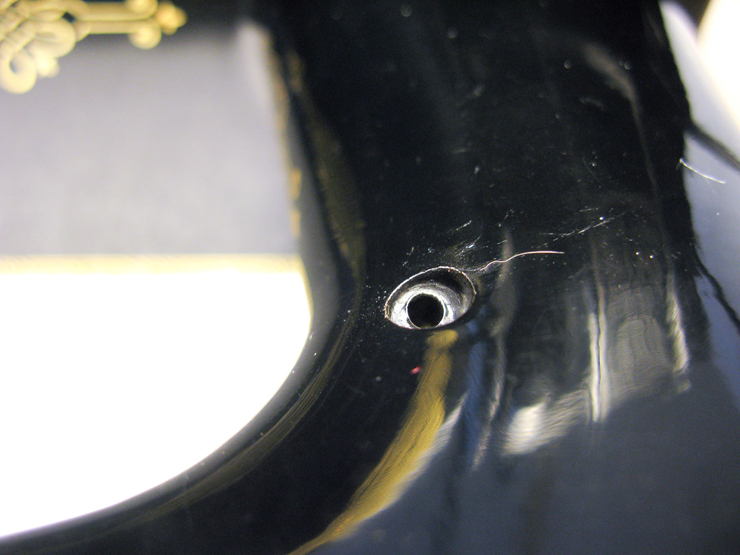 Inside we find another oil hole, and two spots indicated by arrows that should also get a drop of oil. After oiling those, I take the faceplate off with its single screw. As I said earlier, you won't need to memorize these photos, it's just a reference. 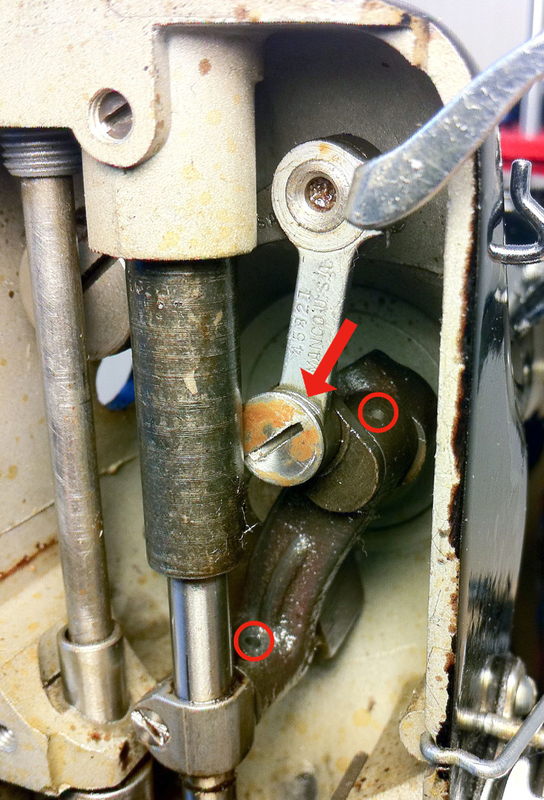 Turn the handwheel to get things moving, and observe wherever two parts of metal rub against each other (arrows), then get a drop in there using the "drop" or "touch" method. Also look for more oil holes (circles) and put a drop in each. 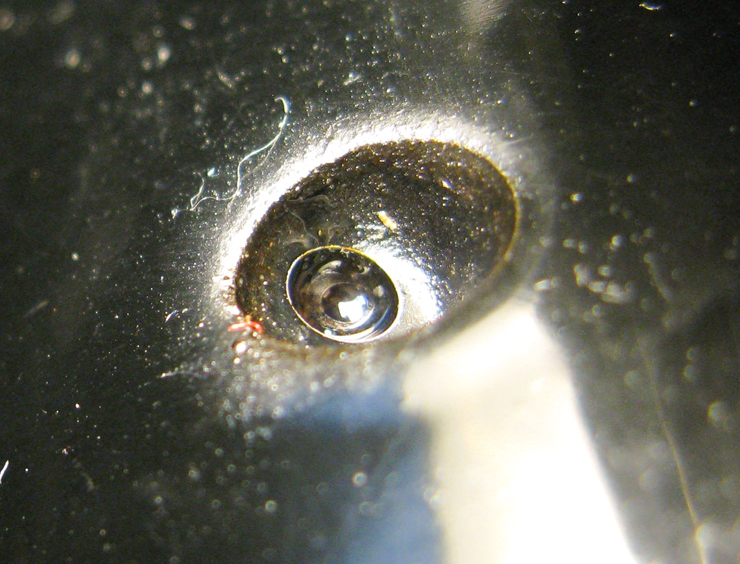 In the photo above, I could not see the oil hole in the photo below. 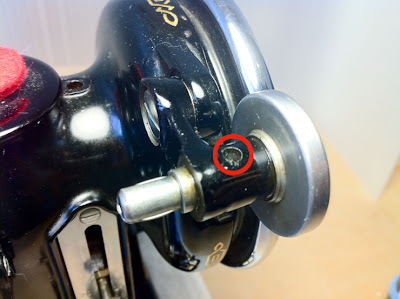 Turning the handwheel reveals different oil holes. More places where metal rubs on metal. After those points are done, I re-attach the faceplate and flip the bed up. 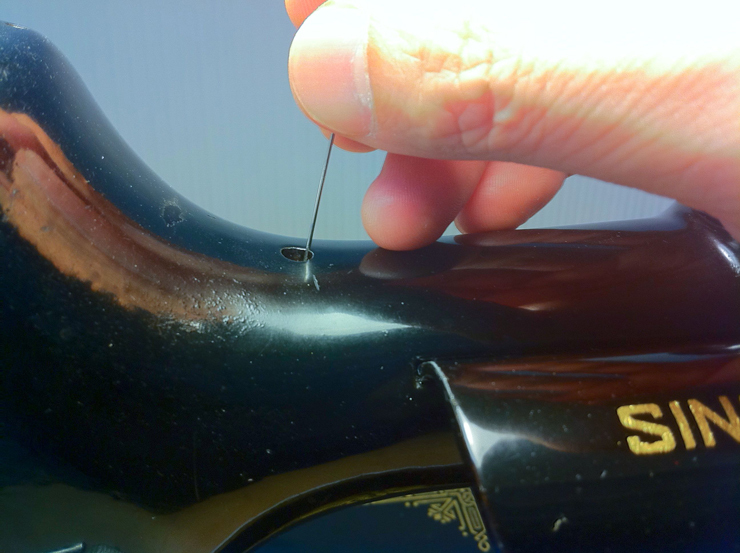 Looking underneath, I remove the bobbin case and put a drop of oil on the hook race. 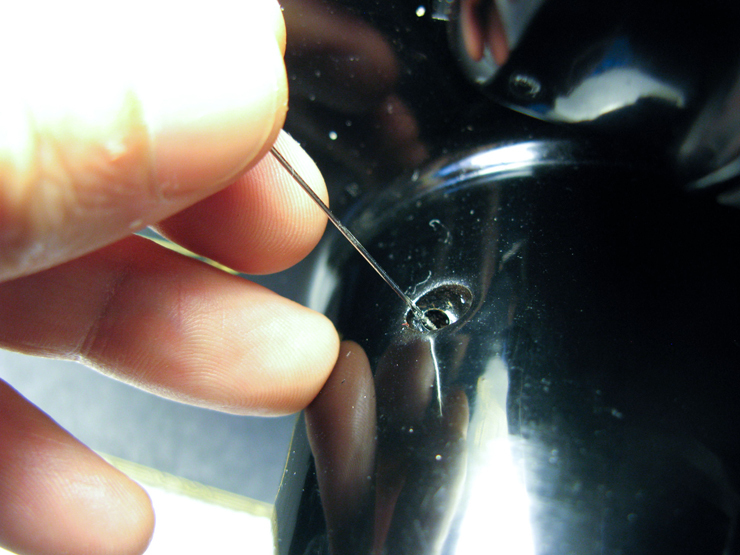 If you're not sure exactly where to put it, just look for where metal rubs on metal. Turn the handwheel over a bunch of times to let the oil circulate, then put the machine on its side. Keep the bed flipped to the "up" position to give it some support, and don't forget to lean it on the towel to avoid scratches. Unscrew the bottom cover. And by the way, when you put it back on, you don't need to go nuts tightening the screw. The cover's not going to just fly off, so screw it shut gently. On some of the 221s I come across, this thing is screwed shut like someone's life depended on it. 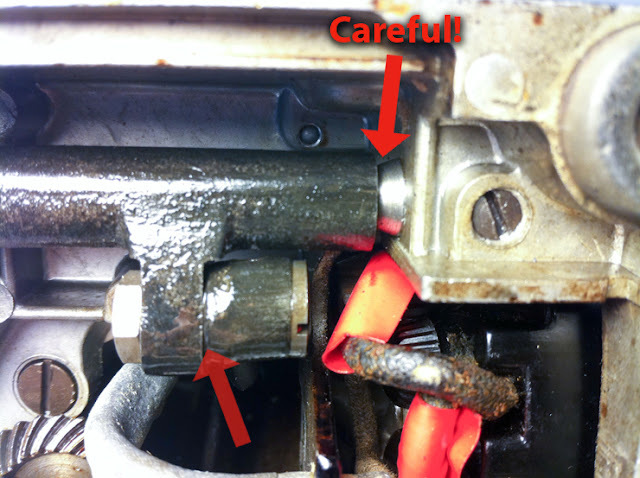 Don't be intimidated, just turn the handwheel and look for moving parts or oil holes. To help you recognize them, see the arrows and circles here. Be careful with this one indicated below, because it's very close to the wiring. Just place one careful drop on the metal, we don't want a bunch of oil dripping on the wiring insulation. That will eventually eat through it and cause potentially dangerous electrical problems. After you've done these points, that's it, you're finished. Remember, just one drop of oil in each location, be careful not to spill any on the wiring, and you can't go wrong. Close the machine back up and you're good to go. If you order it from the Amazon link, I get a tiny percentage. I put these links here in case any of you need the product and want to support this blog in the process. The price is the same as it is on Amazon's normal site. But remember, you don't have to buy anything through this blog, so feel free to ignore those links. By the way, some of you may have noticed I did not oil the geared parts of the machine. Those parts get grease. I'll cover grease in another entry. Excellent post. Thank you! I have a FW and it's nice to have such a nicely illustrated guide. Great post. This is such an everyday thing but so important. Nicely done! I've got two Featherweights (one I bought, and one from a friend whose mother had passed, and he wanted to give it to someone who would use it.) The manual isn't nearly as good as this tutorial, and I really appreciate you putting this information out there in such a clear and direct fashion. Thank you! Your tutorial is terrific and the pictures are excellent. I've sent a link to your post to all my Featherweight 221 friends. Thank you for your time to keep us informed. Great resource. When I pass on a machine, this site will go with it. You have put in the hours on this blog! The least I can do is to order the oil from Amazon. Thank you for this wonderful site and information. 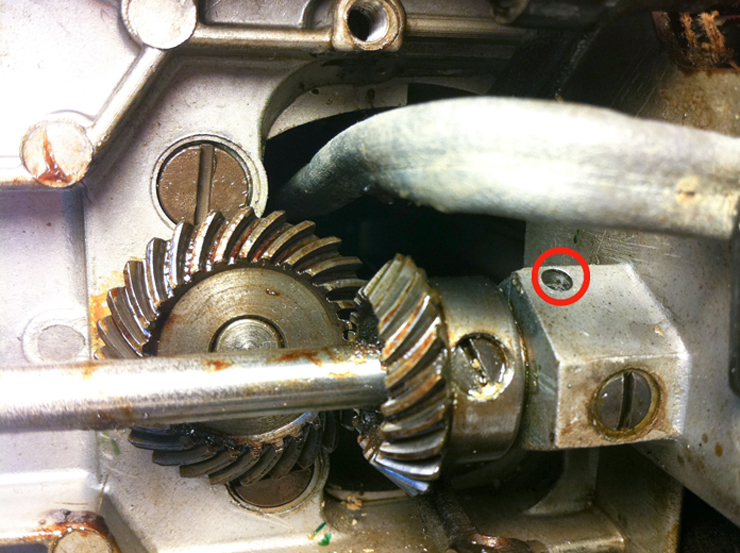 Do you know when you will post the information on greasing the gears of a 221? 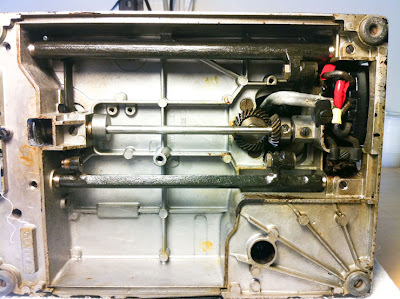 Other than oiling and greasing the gears, what is recommended to do to a newly acquired 221? Great tutorial! 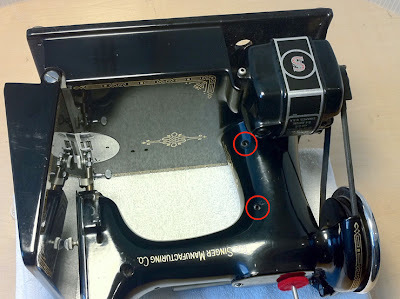 And I kept it in mind last night when I was in Goodwill, looking at sewing machines; I opened up the faceplates and poked a toothpick into the oil holes, looking for a clean, well-maintained machine. For $12.50, I came away with a really sweet model 348 (in robin's-egg blue!) from the '60s that, while "attic fresh" outside is absolutely immaculate inside. She was obviously cared for back in her day. So I shall oil her up and take her for a spin later today. When Peter at Male Pattern Boldness posted about your blog, I think I read maybe the first four sentences of his post before coming over here and immediately subscribing to your feed--I'm absolutely thrilled you're doing this. I also have a model 15 that runs, but needs serious cleaning up (and a bobbin case), and a 'Dressmaker' brand model 15 clone with a motor that needs attention. I at least want to get the 15 cleaned up and back to work by the end of summer, but wasn't sure where to start--and now I know. Thank you so much for all the work you've done here! I look forward to future posts! You make it seem so easy! Thanks. Thank you! 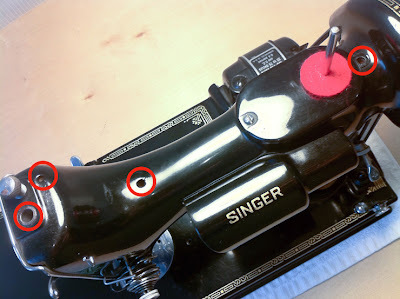 I inherited my grandmother's old Singer that we're pretty certain is from the turn of the 20th century and was refitted for electricity and since the original owner's manual has long since been lost, this is a sanity saver. Holy cow, talk about good timing! Yesterday Peter Lappin had a link on his website to yours, so I read and bookmarked your site. Last night I was complaining to my husband about what a mess my newish Singer machine is and how I wished I had a vintage Singer. He went upstairs and came back down with a mysterious black case, which I opened up and revealed a circa 1949 Singer 221-1 in perfect condition with all the attachments. Thanks to this blog on oiling the machine, I was able to get my 'new' Singer up and running in no time at all! Thanks so much! 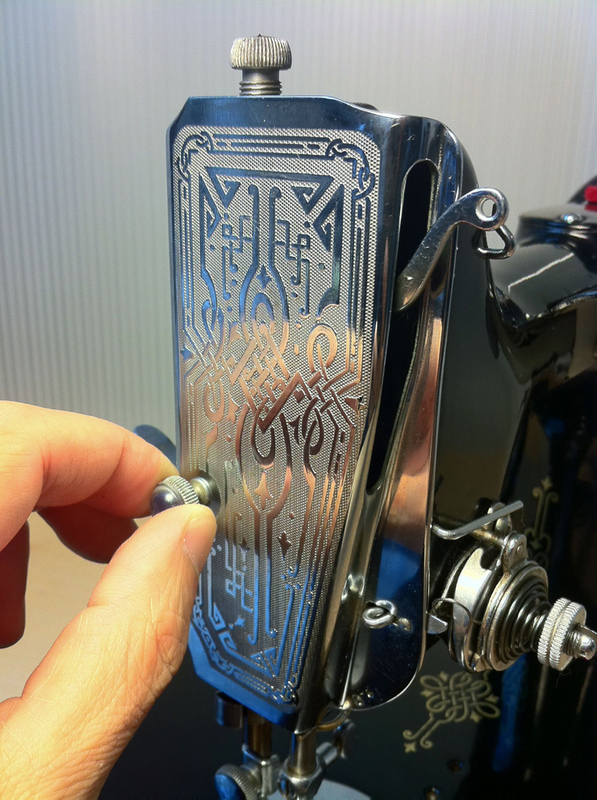 I have a 1922 Singer tredle machine that has seized. Is there any way to get it back to working condition? I have oiled it and managed to get the bobbin winder to work, but the rest of the machine is not budging. Fantastic! Thanks for a very helpful article. I just had a guessing attempt at oiling my machine a few minutes ago then found your article - so now I'll get the machine out and put a drop in the oil holes that I was convinced were not oil holes (I only put a drop on moving metal on metal parts - like I said: guessing). 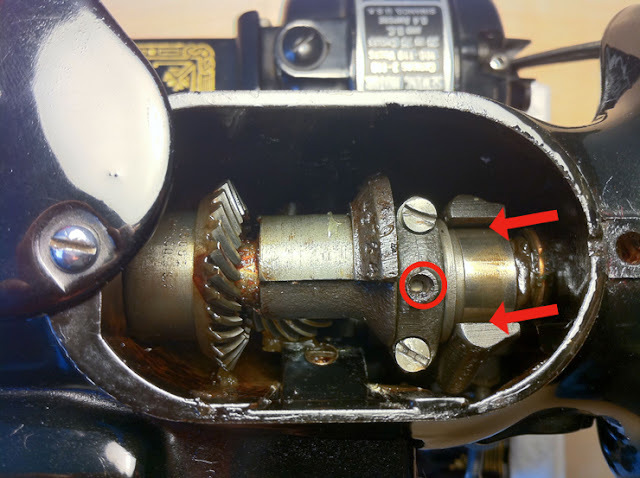 Hi, you mentioned making a separate entry about greasing parts on a sewing machine. Was this entry ever made? I'm scouring the internet for greasing instructions for my Singer 127, and all I'm finding is oil diagrams :( Any help would be greatly appreciated. Thank you so much for this detailed post! 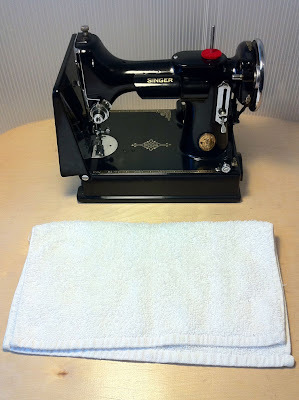 I just bought a featherweight and your blog has been the best resource. I have a 221 and really appreciate your blog on how to oil it. I call Singer and gave them the serial number and I was told it was made (born) 5/24/1938. That just amazed me. This machine has been in my family for generations and now it is mine. My mother used it all the time and it works beautifully. Greatest little sewing machine I have ever seen. Small, lightweight and just easy top wip it out quickly to use. I reall appreciate the details and photos on how and where to oil and your recommendation on exactly which oil is good to use. Thank you again for this article and I will order Triflow from Amazon as suggested. Would also like to see how to grease this machine and what type of grease to use. 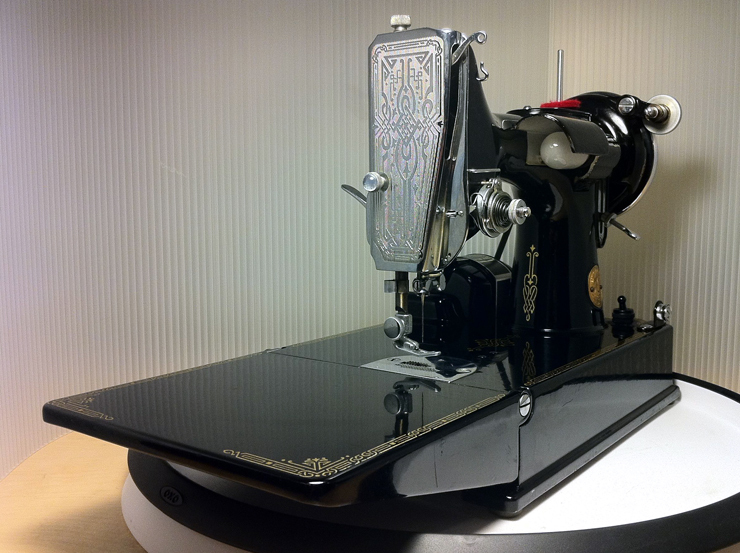 Don't want to mess up a machine this nice but also want to give it the best care I can. Thank you for the excellent step by step guide. I have just completed oiling my "new" 221-1 and am ready to give her a job to do. I just purchased a industrial singer 241-12. Its a self oiling machine that take 1 1/2 quarts of "type-A or type-C oil" according to the old manual. I can't find any type-A or type-c, so what type of oil should I bue? I've run into the same issue with a few of my industrials, and have yet to locate anyone who can tell me what "Type A" or "Type C" oils are, or where I can get them. 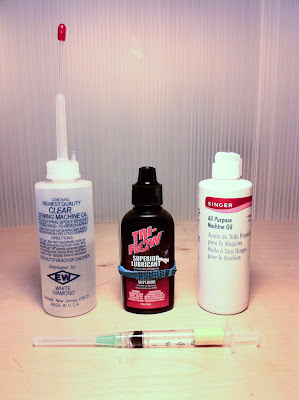 In the meantime I've been using the regular clear oil that's sold for industrial sewing machines. Can't remember the name--I bought a gallon jug and distributed it into smaller bottles--but I think it was called "Lily White" or somesuch. If you find out what "Type A" or "Type C" are, what makes them different and where we can get it, please be sure to let us know. 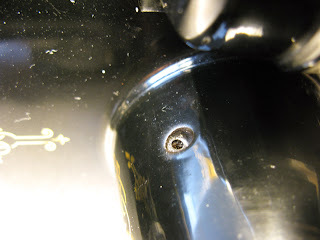 Mr. Noe, I just unscrewed the bottom of my vintage Singer (I think it is around 1926) to find that it has been nailed shut!! The nails have been painted over with the same varnish that is on the bottom plate, so it must have been done ages ago. I hope it wasn't my grandpa who "fixed" my mom's guitar by gluing the bridge down... We had taken the machine to be serviced a few years ago and as far as I know, the guy didn't mention it! What should I do?? I don't think I can get the nails out without destroying the bottom! Hmm, maybe it has not been nailed shut... I removed three small screws that were quite gently turned into the bottom. They were sitting on the top of the plate, not recessed. Now I see that there are two very large recessed screws, but when I screw them to the left, they move a tiny bit and then are stuck completely. Am I in danger of damaging anything if I apply a lot of force? Heather, I have no idea what model you're discussing, nor the exact pieces that you're referring to. If it's from 1926 it's definitely not a Featherweight, as those didn't go into production until the 1930s. If you can send me some well-lit photos that would help. I guess my other comment didn't make it on the other day. Thank you for replying so quickly, though! I didn't know anything about the different models at the time, so I didn't realize that other "portable" machines just hinge out of their bases. After some fiddling with my machine I figured it out! I've been researching for the past several hours and I've learned a ton! It turns out that I have a Singer 99-13. Sorry for being a panicky ditz on your blog! Thank you for a very informative post, it was quite helpful. The only thing that confused me was that you said any hole without a pin sticking out was an oil hole, so I put oil in three holes that I shouldn't have... You have the same holes on your featherweight. One is in the D shape next to the bobbin plate, and the other two are for screwing in attachments. I didn't think I should put oil in them (I could see the threads), but I didn't know what they were for so I put a tiny bit in. Now I see that they just drop down into the base! But no harm done. There was also another hole that looked exactly like all the others right next to the wiring that wasn't anywhere near anything mechanical and seemed to only have wood underneath it. I avoided that one, but I was uncertain for a moment! This article was recommended to me by a friend on Facebook. I'm so glad she pointed me in this direction. Now I think I can handle oiling my 15-90.